All gifts will be collected automatically until May 8, 2019. When Mission work gives you lemons, you can make lemonade. We sent a group of workers and building materials to our orphanage in Rakhine only to have their work interrupted by fighting between the Arakan Army and the government of Myanmar. Getting caught in the middle of a battle can be very dangerous in several ways. The first is, that, obviously you can get shot or blown up! But in addition to that, either army can instantly draft you to join their cause. Our workers and our folks from Foundation Church of Myanmar had to flee the area before the planned work could be done on the orphanage. Six hours northeast we have been working on a church in the village of Bogalay and work still needed to be done. We were planning to have them work on the church after they were done working on the orphanage but now they are basically stuck at the church waiting for the fighting to stop so they can work on the orphanage and then go back home to Yangon. 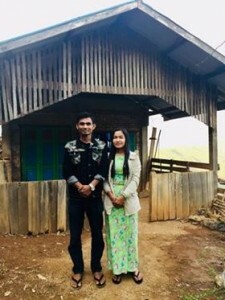 Pastor Naing was wise and took full advantage of this unexpected extended stay in Bogalay and put the workers to work building a house for a man and his wife who will be working in Rakhine. We need help getting extra material to make best use of these workers. The man who will be living in the house is Zaw Min Aung. Will you pray for them and consider helping us finish the house they’ll base out of. 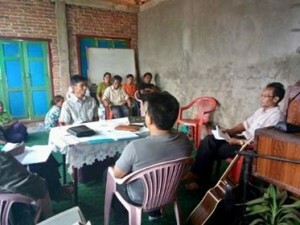 Zaw Min Aung was recently examined and ordain by Foundation Church of Myanmar as an Evangelist?